In a large bowl, cream butter and sugar until light and fluffy. Beat in egg and extract. In another bowl, whisk flour, baking powder and salt; gradually beat into creamed mixture. Reserve 1 cup dough. Tint remaining dough red; shape into a 3-1/2-in.-long roll. Wrap in plastic. Tint 1/3 cup of reserved dough green; wrap in plastic. Wrap remaining plain dough. Refrigerate 2 hours or until firm. On a lightly floured surface, roll plain dough into an 8-1/2x3-1/2-in. rectangle. Unwrap red dough and place on a short end of the plain dough; roll up. Roll green dough into a 10x3-1/2-in. rectangle. Place red and plain roll on a short end of the green dough; roll up. Wrap in plastic; refrigerate overnight. Preheat oven to 350°. Unwrap and cut dough into 3/16-in. slices (just less than 1/4 in.). Place 2 in. apart on ungreased baking sheets. 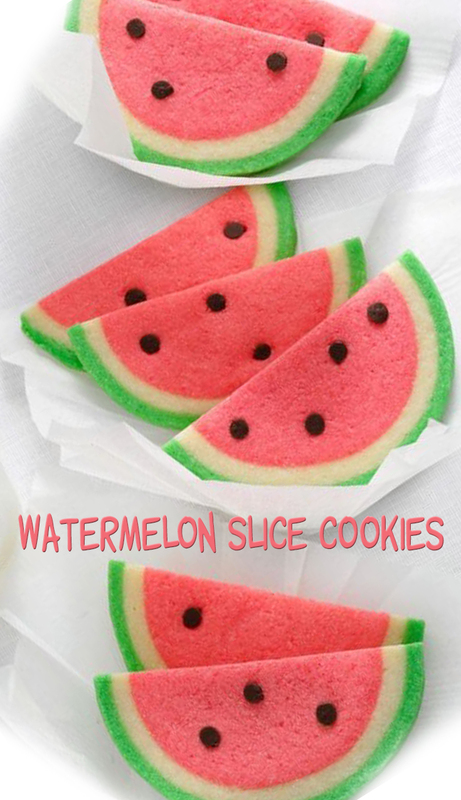 Lightly press chocolate chips and, if desired, sesame seeds into red dough to resemble watermelon seeds. Bake 9-11 minutes or until firm. Immediately cut cookies in half. Remove to wire racks to cool.